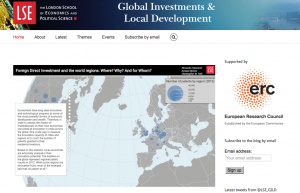 If you are looking for fresh perspectives on how globalization impacts development, we encourage you to check out the new LSE Global Investments & Local Development blog. The blog aims to tackle and debate fundamental questions related to the location strategies of global investment flows and their impacts on their host countries, regions and cities across the globe. It fosters dialogue between academics in all fields, students, policymakers, economic development practitioners, businesses, managers and members of local communities. More information is at the following link.